OLIOMIO® has redefined olive oil extraction for the small producer. No longer is the only option to harvest the olives and haul them to a large production mill for processing. Today, a grower can harvest the olives and within minutes (not days) begin extracting a beautiful extra virgin olive oil – the freshest and best quality imaginable! 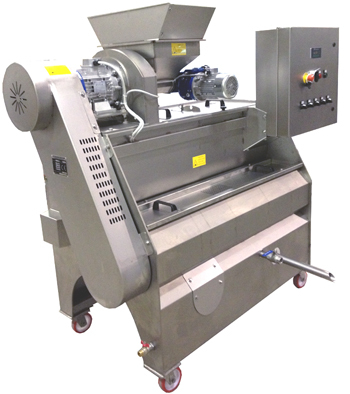 The beautifully designed OLIOMIO® mills are very compact with automatic, non-stop olive processing stages in a single structure. The small continuous flow plants employ all of the extraction processes of a large milling operation in a reduced platform. Operation is very easy: once the olives have been properly cleaned and washed they are poured into the receiving hopper where a screw feeds them to the crusher that reduces the olives into a paste. The paste falls into a lower mixer, where a helicoidally shaped stirrer prepares it for extraction. A pump then sends the paste to a decanter where separation takes place – extra virgin olive oil pours from a spout on the front of the machine and the paste exits the back. In 1984 TOSCANA ENOLOGICA MORI (T.E.M.) 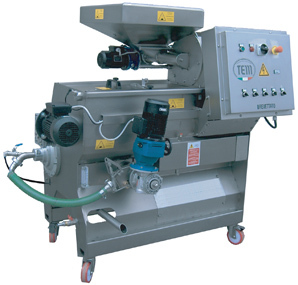 began production on the first “small oil mill”, utilizing natural decantation separation. By 1993 planning had started on OLIOMIO®, a mcahine based on an entirely different concept from all others on the market until then. 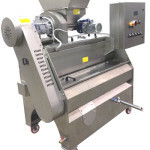 The new machine was a compact stand-alone unit, with a hopper where the olives were loaded into, cold-worked into a two-phase system, and on one side the oil comes out, on the other, paste. All of this was accomplished without the need for additonal water for extraction, and without the need of a final separation. It was revolutionary. Three years later, in 1996, the first OLIOMIO® went into production. In the years to follow, several new models have been introduced.